The British monarch, whose family will confiscate $96 million dollars from its English taxpayers to pay for their cost of living in their castle this year, delivered her message this year urging her subjects to come together and treat each other with respect. “Even with the most deeply held differences, treating the other person with respect and as a fellow human being is always a good first step towards greater understanding,” said the 92-year-old monarch who has lived off the backs of British citizens in a plush castle with hundreds of servants since just after WWII. 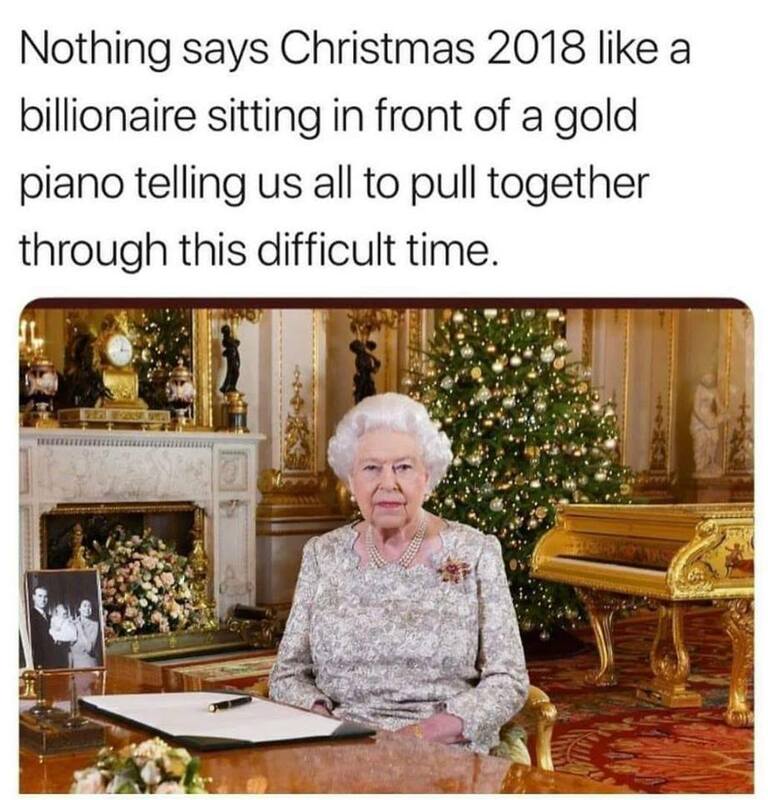 Naturally, the Queen’s message of unity and respect for fellow humans was not very well received by those who foot the bill for her lavish lifestyle. Perhaps some of this angst is due to the fact that in 2015, the Queen was seen on video giving the Nazi salute, during Hitler’s rise to power. As TFTP reported at the time, in the video the Queen and the Queen mum raise their Nazi salutes proudly for the camera. The film shows the then Princess Elizabeth, just seven, larking about in 1933. Egging on her sister Princess Margaret, three, is their uncle Prince Edward, Prince of Wales. He was a sympathiser towards Hitler’s Nazi Germany and became King Edward VIII. The stunning film footage of the Queen performing a Nazi salute is today revealed by The Sun. The astonishing clip lay hidden for eight decades. The grainy home movie is thought to have been shot in 1933 or 1934, as Hitler rose to supreme power in Germany. It is a matter of historical record that Edward VIII was, in fact, a Nazi sympathizer which makes the claims of childhood fun by the Queen to defend the video, all but irrelevant. When the Queen isn’t saluting the regime responsible for the horrid deaths of 6 million Jews, she exploiting poor and mentally ill individuals. As TFTP reported, the release of the Paradise Papers, a leak comprised of over 13.4 million documents, exposed the Queens insidious exploits of the mentally ill. The documents included in the leak came from two offshore services providers and the company registries of 19 tax havens, which was obtained by the German newspaper Süddeutsche Zeitung and shared by the International Consortium of Investigative Journalists. “Queen Elizabeth II has invested millions of dollars in medical and consumer loan companies, Appleby’s files show. While the Queen’s private estate, the Duchy of Lancaster, provides some details of its investments in U.K. property, such as commercial buildings scattered across southern England, it has never disclosed details of its offshore investments. ‘Yes, the Duchy was aware that the Jubilee Absolute Return Fund was run offshore,’ said Chris Addock, chief finance officer of the Duchy of Lancaster. According to a report from the Guardian, which partnered in sharing the revelations from the Paradise Papers, over the last 12 years at least, the Queen’s estate has made significant investments in businesses such as the off-license chain Threshers and the retailer BrightHouse. Last year, BrightHouse, which is Britain’s biggest rent-to-own retailer, was ordered to pay 14.8 million pounds to 249,000 customers after the watchdog Financial Conduct Authority found that the retailer was guilty of overcharging customers and intentionally taking advantage of people with mental health problems and learning disabilities.